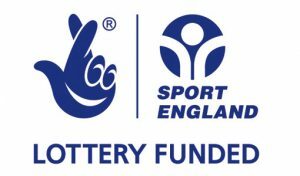 The Saints claimed their 2nd straight win on Sunday in a closely fought battle against the Ouse Valley Eagles. Oxford began with the ball but after a incomplete pass and two short runs, the home team were forced to punt the ball away. The visitors kept the ball on the ground and although only gaining a few yards on each play, they were able to progress down the field into field goal range. Failing to gain another first down, Scott Gale attempted the kick from 32 yards out but missed his target. 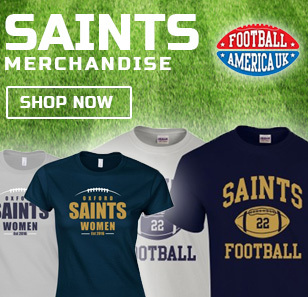 Back on offense, the Saints struggled to get things moving with runners Shaun Griffin and Isa Mohammed being tackled in the backfield for a loss of yards. Another incomplete pass attempt saw Oxford punt the ball away again. The Eagles meanwhile put together another drive with a series of short runs, helped along the way by multiple penalties against the Saints defense. 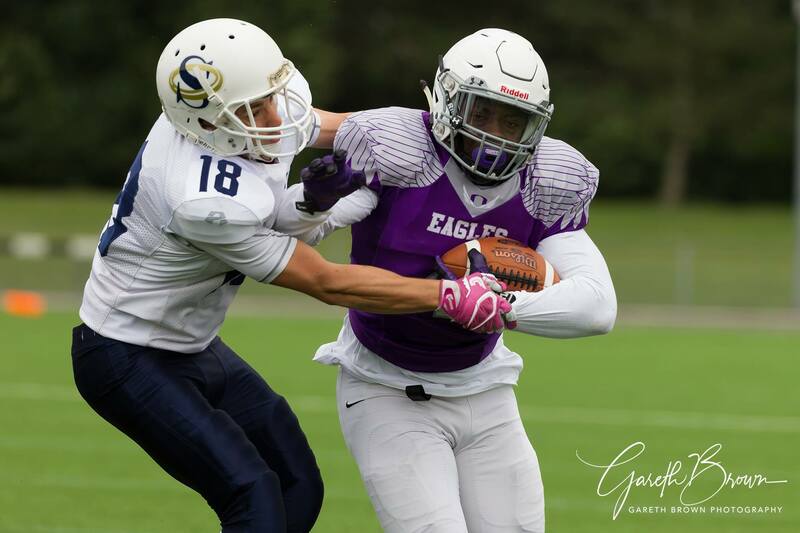 These penalties proved crucial as they allowed the Eagles to keep their drive alive, with Mateusz Garus running the ball in from 10 yards out for a touchdown. Gale attempted to add the extra point but his kicked missed to the left. 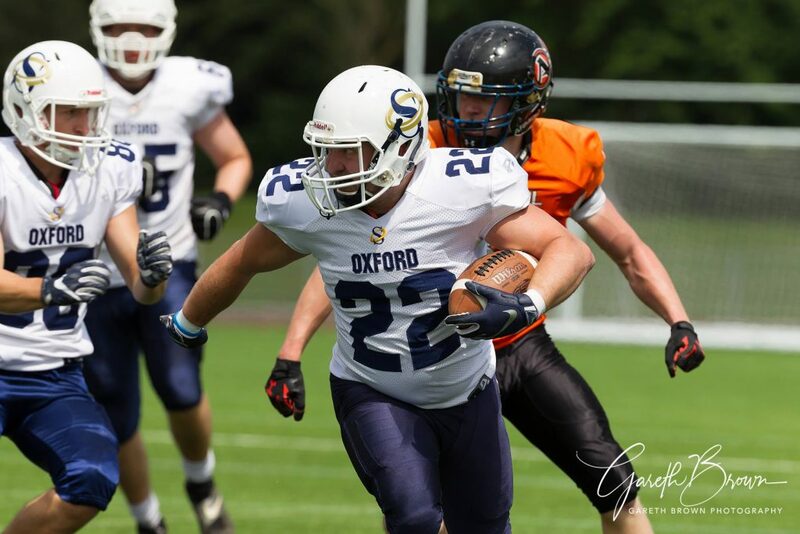 Oxford’s offense gained momentum when James Sharples connected with Jeremie Leonard for a 32 yard completion down the sideline. Sharples took a shot into the endzone attempting to hook up with Leonard again, but it was incomplete. On the next play, running back Isa Mohammed ran through mutliple defenders and into the endzone for a 26 yard touchdown. Sam Fielden kicked the extra point, giving Oxford a 7-6 lead. Towards the end of the first half, two break away runs from Ouse Valley saw them gain 39 yards and 36 yards on back to back plays. With just 1 yard to go, Jamie Smith ran the ball over the goalline for a touchdown. Gale added the extra point and the Eagles took a 13-7 lead. Oxford attempted to answer back before the end of the half with Charlie Hill nearly hauling in a touchdown pass, but the Eagles defenders forced an incompletion. The majority of the 3rd quarter saw both sides battling back and forth but neither able to find the endzone. Near the end of the 3rd quarter, the Saints were marching across the field with strong running from Mohammed, Griffin and Tony Glover each picking up yards. With the goalline in sight, Sharples passed the ball into veteran receiver Sam Armstrong for the touchdown, keeping hold of it whilst being hit by the Eagles defenders. Fielden kicked the extra point and Oxford were in front again 14-13. Following adjustments made at the half time break, the Saints defense had become a different force, preventing the Eagles from gaining a single first down in the 2nd half. Oxford meanwhile continued to use up the game clock with run plays as they rotated through their various ball carriers. Keeping the offense on the field, Sharples connected with Leonard once again for a 24 yard gain. Although close to the endzone, the Saints were unable to put another touchdown onto the scoreboard. With the defense shutting down a final drive from the Eagles after a incomplete pass on 4th down, Oxford’s offense assumed a ‘victory formation’, with Sharples kneeling out the remainder of the clock to secure the win. With Sunday’s win, Oxford now have their 2nd of the season in a competitive Division 1 Central conference. 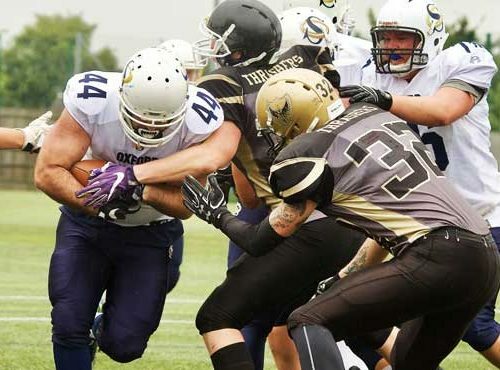 After a week of training, Oxford will next be travelling to the Bristol Apache on 1st July, who they recently defeated in a 52-22 win on 10th June. 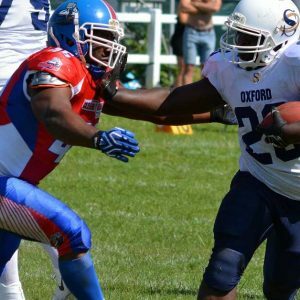 Following last week’s heavy defeat, the Oxford Saints bounced back in style with a dominating 52-22 victory over the Bristol Apache. 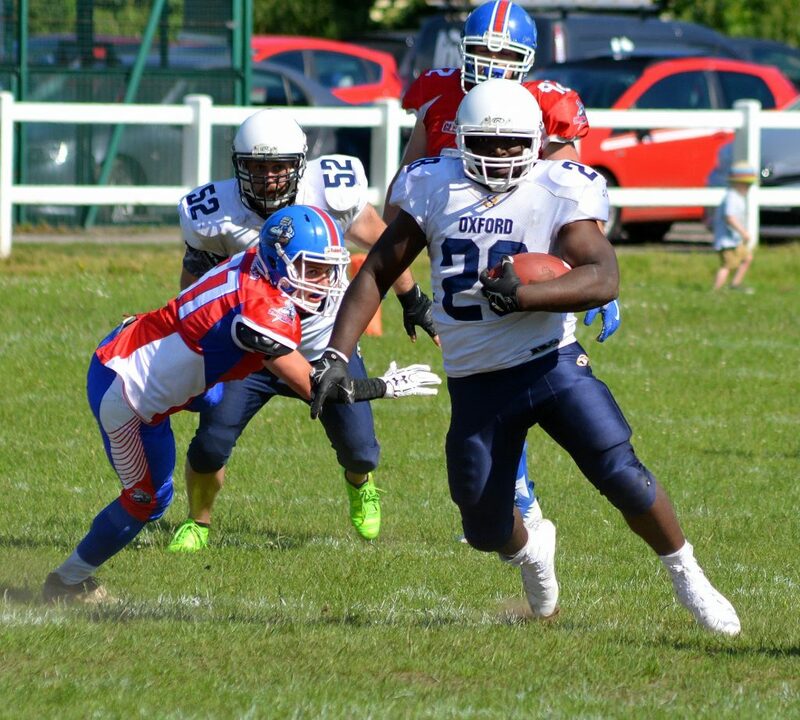 With both teams hunting for their first win of the season, the Saints had numerical advantage with a larger squad and were playing at their home ground Tilsley Park in Abingdon. Bristol started on offense with Oxford’s defense forcing a fumble on the opening play. The visiting team maintained possession but suffered a 3 yard loss after the tackle by Jonny Little. On the next play, the Apache runner broke free for a substantial 46 yard run. To cap off their opening drive, quarterback Andy Watts kept the ball himself and ran into the endzone for a 8 yard touchdown. Adding an extra 2 points, Watts passed the ball into the hands of Freddy Marshall for the conversion. 8-0 Bristol. 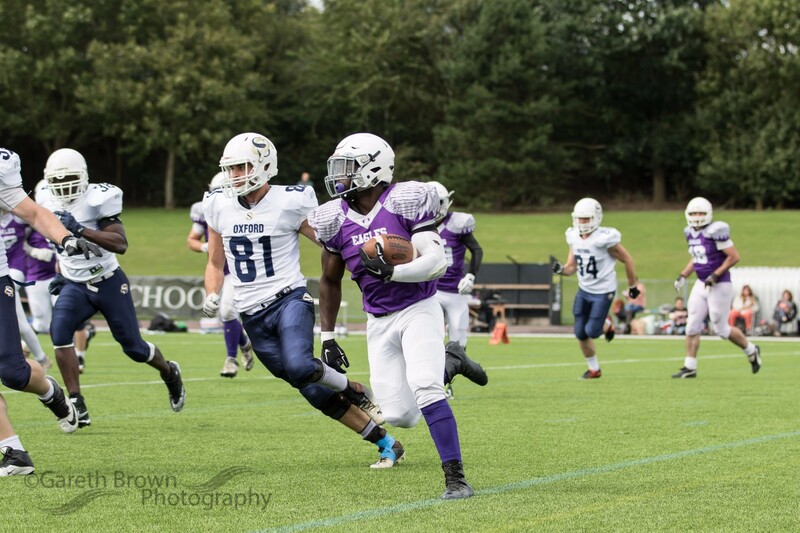 Despite strong running on Oxford’s opening drive by Shaun Griffin, the Saints were unable to keep it going when a bad snap saw quarterback James Sharples having to react quick, running into the backfield to recover the loose ball but for a loss of 14 yards. On their next drive, the Saints marched the length of the field in just five plays. Keeping the ball on the ground, big runs came from Tony Glover who picked up 28 yards and rookie Isa Mohammed storming through for a touchdown on a 31 yard run. Sam Fielden’s extra point kick missed it’s target to the left. 8-7 Bristol. During the 2nd quarter, the Saints offense with a number of dangerous running backs proved too much for Bristol’s defense to handle. Griffin entered the endzone and the extra kick was good, giving Oxford a 13-8 lead. Another scoring drive would soon follow with Glover picking up multiple first downs, along with a 16 yard pass from Sharples to Sam Armstrong. Claiming his 2nd touchdown of the day, Mohammed ran through for a 27 yard score. Another kick from Fielden pushed the Saints ahead 20-8. Beginning the 2nd half with the lead and possession of the ball, the Saints quickly put together another scoring drive. Connor Day and Griffin picked up first downs on back to back runs. Glover finished the drive punching the ball in from 1 yard out, with another accurate kick from Fielden. 27-8 Oxford. The Saints continued to dominate the game throughout the 3rd quarter with their defense holding Bristol to minimal gains. Meanwhile Oxford moved the ball with ease on the ground from a variety of running backs, with Mohammed, Griffin, Glover and Matthew Powell all making yards. Another sustained drive saw the Saints reach Bristol’s 2 yard line, with Armstrong crossing over for the next touchdown and Fielden remaining consistent. 41-8. On the following kick off, Bristol managed to force a change of possession when they recovered a live ball, bringing their offense back out onto the field on Oxford’s 19 yard line. In just one play, Watts connected with Powell-Cullingford again for 19 yard touchdown pass. Attempting to pass the ball in for a 2 point conversion, it fell incomplete. 44-22. Frustrated that Bristol were able to score twice in quick succession, the Saints would have the final say of the game with Sharples spreading the ball around well to multiple receivers. Jason Williams caught a first down pass for a 11 yard gain and Sharples connected with Jeremie Leonard on a 14 yard touchdown. To wrap things up, Oxford used the opportunity to practice a trick play on the extra point kick, with Fielden faking his kick as Ian Hiscock passed the ball to Armstrong instead, securing 2 further points. Oxford have no time off as they are back in action again this Sunday at home against the Ouse Valley Eagles. With the 3rd straight game on the road, the Saints suffered a heavy defeat. In recent years, it had been the Saints handing out such punishments and they hadn’t endured such a scoreline since a 51-0 loss in 2013 against the Cornish Sharks. In the competitive central conference of Division 1 South, the Oxford team travelled with various missing players and felt their absence, especially on defense. 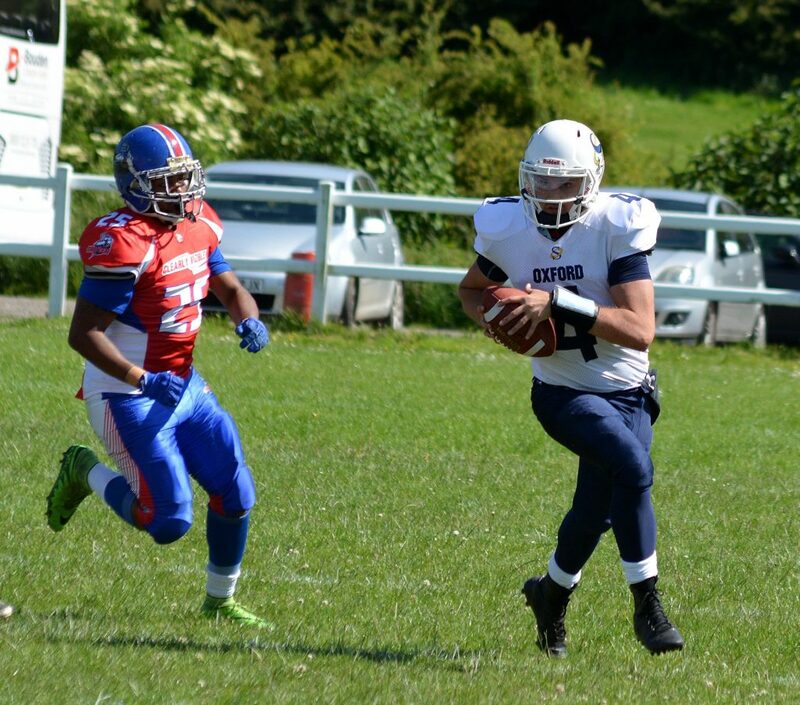 The Saints faced the Sussex Thunder three times in the 2017 season and although they conceded all three games, two of them were close fought affairs, including a narrow 1 point loss. 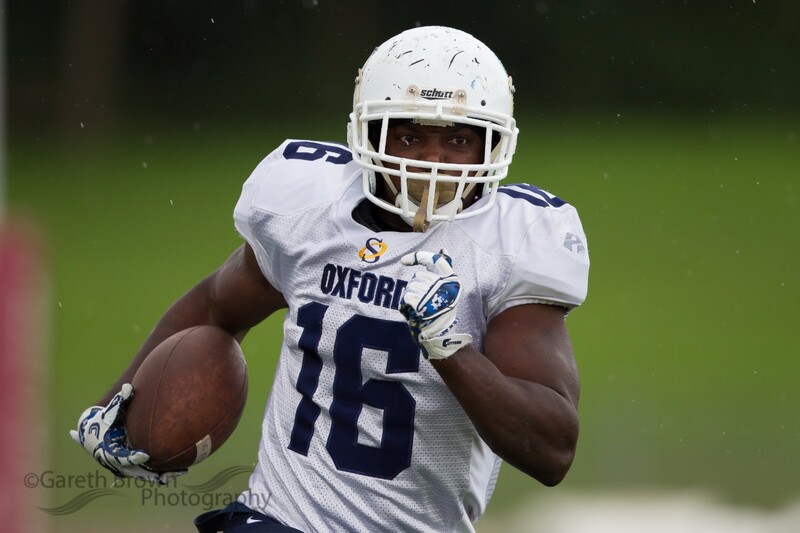 Oxford began with the ball and had quarterback James Sharples as the starter. With two carries from Shaun Griffin for a combined 9 yards, the Saints attempted a pass but failed to gain the additional yard needed for a first down and punted the ball away. With the Thunder offense out on the field, veteran quarterback Eber Kington led his unit to a quick score. 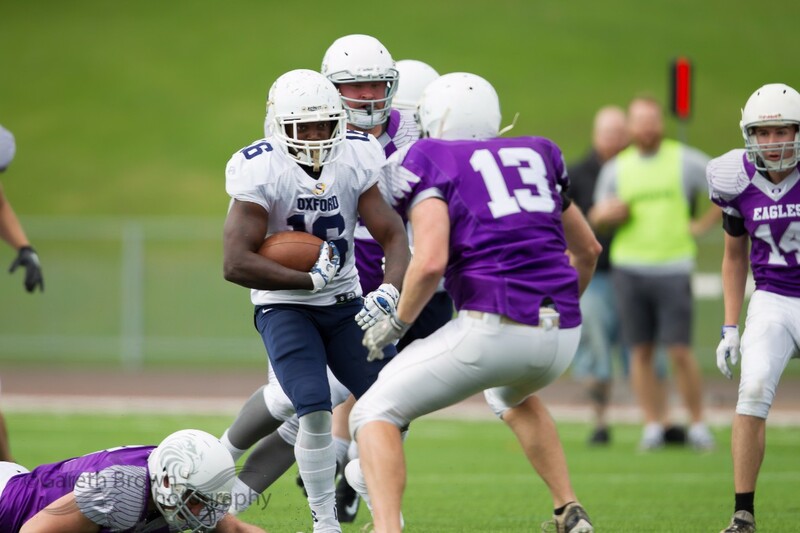 After two short run plays, Kington connected with receiver Chris Evans who hauled in the ball and ran into the endzone for a 48 yard touchdown. James Brooker added the extra point kick. 7-0 Sussex. Looking to respond, the Saints put together a sustained drive across the field with running from Griffin, Connor Day and Isa Mohammed. On 3rd down, Tony Glover was handed the ball and ran for a 22 yard gain and a crucial first down. 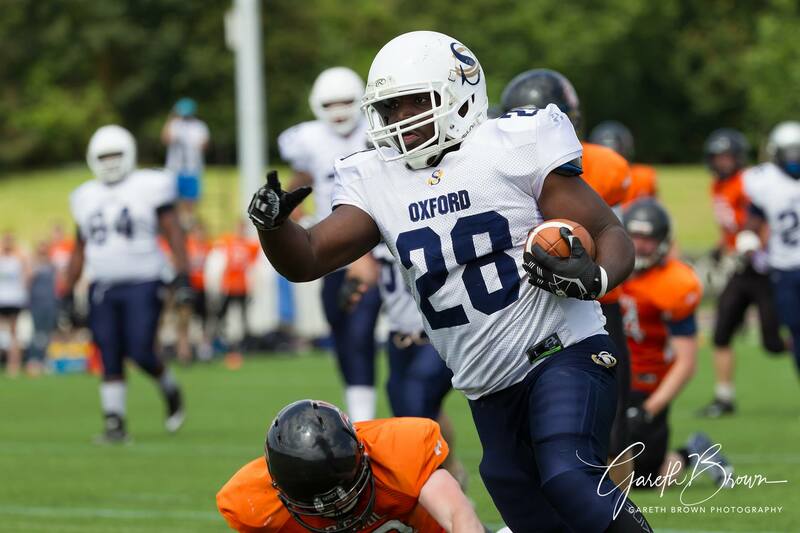 With the endzone in sight, Mohammed got the Saints onto the scoreboard as he charged into the endzone, claiming his first career touchdown for Oxford. 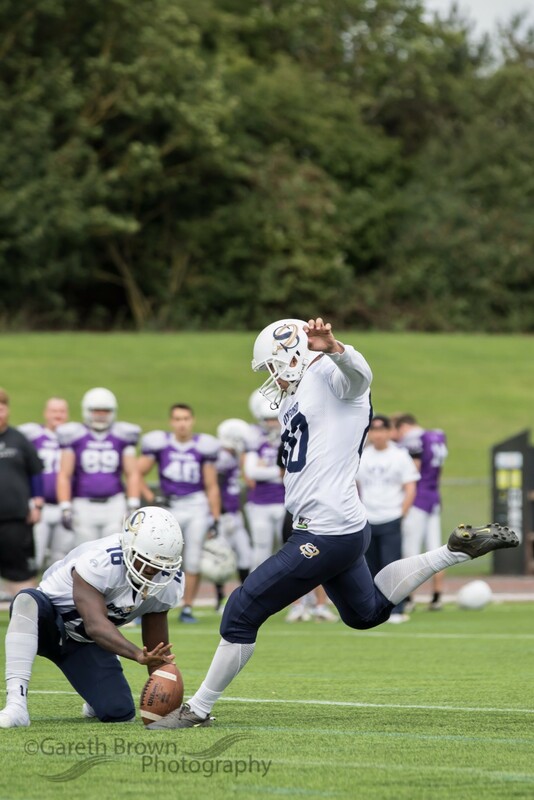 Sam Fielden added the extra point to equalise. 7-7 tie. Expecting the game to be a back and forth affair, the Saints struggled to contain the dangerous running back Ben Chukwu-onu, who escaped through the defense for a 34 yard touchdown on the first play of the drive. Brooker added another point to give the Thunder the lead. 14-7 Sussex. After a stalled drive for Oxford, the Thunder offense showed their talents once again with Kington passing the ball to Thomas Kelly on the 2nd play for a 38 yard touchdown. Another kick extended the Sussex lead to 21-7. A fumbled ball on Oxford’s next drive was recovered by the Thunder defense, but the Saints managed to keep Kington and his troops at bay as they settled for a 29 yard field goal from Brooker. 24-7 Sussex. Now in the 2nd quarter, the Saints handed the ball to Mohammed on back to back plays, picking up a first down on a 13 yard run. On 3rd down, the ball came loose and it was scooped up by Thunder’s Samuel Oldfield who returned it the distance for a 45 yard touchdown. 31-7. Ramping up the score even further, Oxford’s defense couldn’t stop Chukwu-onu who escaped up the sideline on the 2nd play of the drive for a 60 yard touchdown and his 2nd of the day. Brooker kicked the extra point and the gulf deepened to 38-7. Hoping to add a consolation score before the end of the half, Mohammed showed his strong running abilities with two first downs on two carries. On the next play an under-pressure Sharples saw his pass intercepted, forcing a change of possession. A good display from the Saints defense kept the Thunder’s offense out of the endzone, forcing a long 43 yard field goal attempt by Brooker, but his kick was blocked. Following a disastrous first half, the Thunder were comfortable with their lead to rest Kington and put in quarterback Jaden Ellis. Oxford’s defense forced their opponents to punt the ball away, giving the Saints their first possession of the 2nd half. On the first play of the drive, a pass attempt from Sharples was intercepted and the Sussex defender returned the ball to the 1 yard before being tackled just short of the endzone by Sharples. Jaden Ellis sneaked the ball up the middle for the 1 yard gain, seeing Sussex pull to a 45-7 lead. 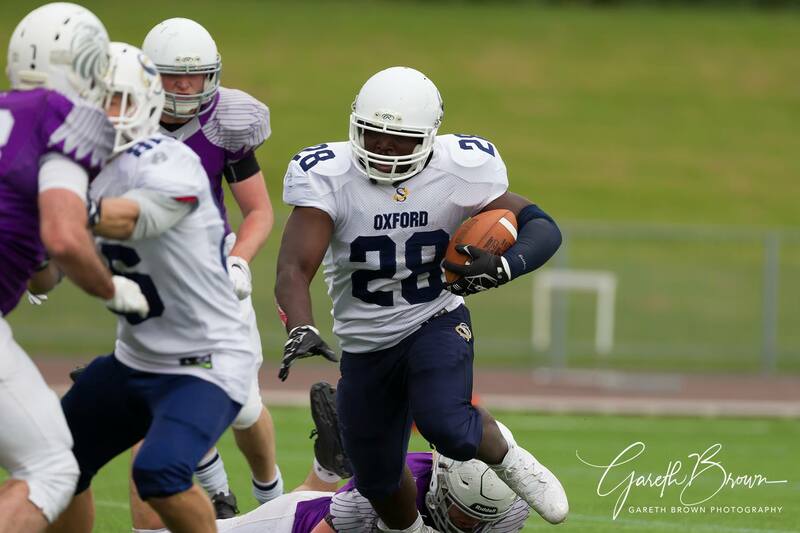 Oxford seemed to find their form when they were marching down the field towards the Thunder endzone, with Mohammed shining with his impressive running, throwing multiple defenders to the ground as he charged through. From 2 yards out, Griffin attempted to enter the endzone but the ball came loose and it was recovered by Sussex, putting an end to Oxford’s promising drive. Although Sussex had possession, they were backed up against their goalline and started on the 2 yard line. Veteran defender Spencer Duffy forced his way through and took down the ball carrier for a loss of 2 yards. As the tackle happened in the endzone, the Saints were awarded a Safety and gained 2 points. 45-9 Sussex. The Thunder offense would add on a final score to have the last say of the game, with Ellis connecting with Chris Evans for a 40 yard touchdown pass and another perfect kick from Brooker. 52-9 Sussex. Although it was a scoreline that the Saints will want to forget, there were still positives to take away. 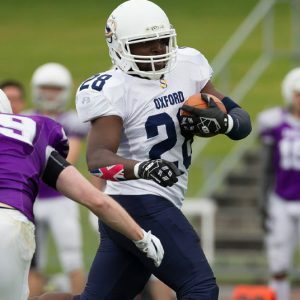 Isa Mohammed showcased tough running and his ability to power through defenders, demonstrating that he could quickly become a key part of the Oxford offense in his first season. Tony Glover was a reliable option as always when the team needed to gain yards, pulling off an impressive 22 yard run. 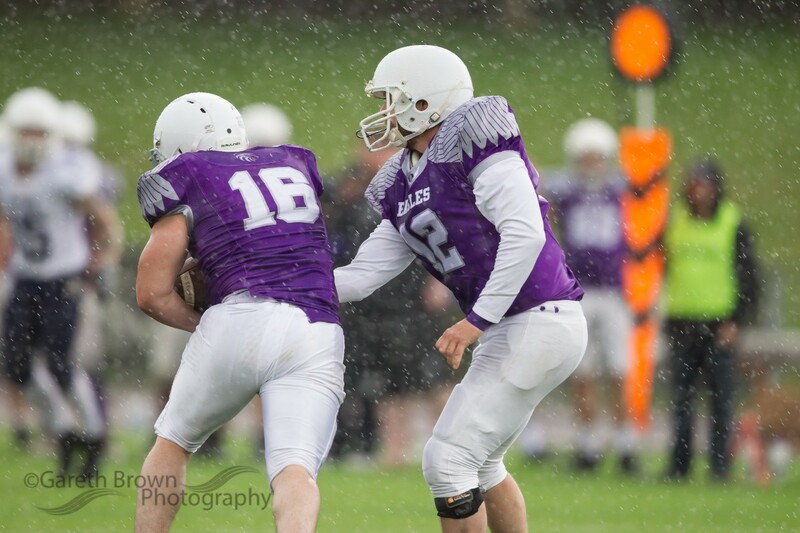 Quarterback James Sharples threw some great passes and was aware of pressure closing in on him, connecting with Charlie Hill who hauled in two quick passes. On defense, paticularly in the 2nd half, there was renewed determination across the board and Eugene Agidee made several key tackles with intensity. Spencer Duffy also added a defensive score with a safety. 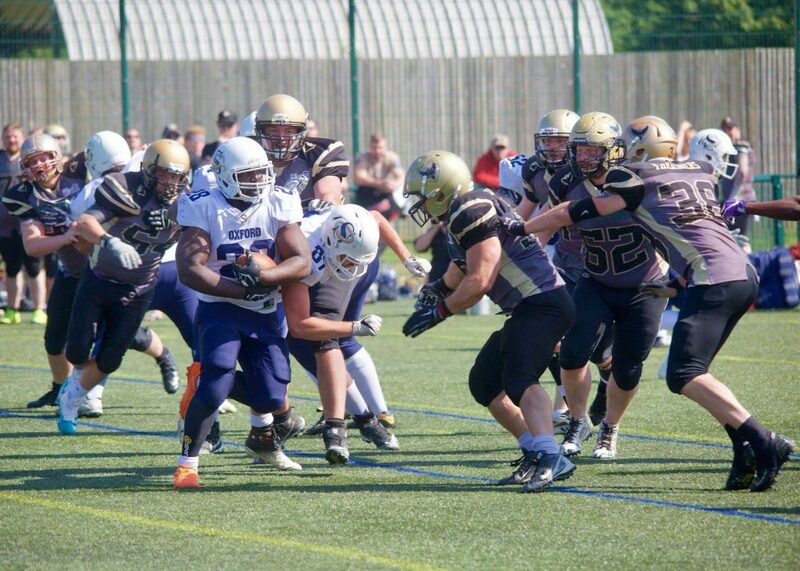 All eyes will now be on old rivals Bristol Apache, who travel to Oxford this weekend on Sunday 10th June. The Saints comfortably dispatched Bristol in their last three encounters whilst both teams were in Division 2. The Saints will have circled this game as a opportunity for a much needed morale boost. The Saints were on the road again for a rematch against the Solent Thrashers. When the two sides met in the season opener, the Saints struggled to keep up with their fast-pace offense but the contest seemed more balanced in round 2. With Oxford opening the game with the ball, quarterback Tony Glover was chased into the backfield on the first play for a loss of 11 yards. Despite a short pass to Jason Williams, the Saints were forced to punt the ball away. Solent’s own efforts were also stopped short, when a 11 yard run for a first down was called back due to a penalty against their offense. Deciding to go for it on 4th down, the ball carrier was tackled behind the line by Sam Stancombe for a 4 yard loss. With running backs Shaun Griffin and newcomer Isa Mohammed, the Saints began moving the ball and picked up a first down from a 14 yard slideline grab by Jason Williams. Unable to reach the endzone, Oxford attempted a 39 yard field goal but the kick from Sam Fielden fell short. Later in the first quarter, the Saints found themselves marching towards the endzone again with hard running from Connor Day, Griffin and Mohammed. The offense picked up another key first down with a 19 yard completion from Glover to Jeremie Leonard. On 3rd down veteran playmaker Sam Armstrong scored on a reverse play, running the ball in from 12 yards out. Fielden added the extra point. With the Thrashers keen to respond, quarterback Bradley Sawyers handed the ball off for a 13 yard gain and a first down. On the 2nd play of the drive, his pass attempt was intercepted by Saints rookie Simeon Stoodley, forcing a change of possession. Nearing the end of the first half, Oxford were moving the ball well on the ground again with carries from Day and Mohammed. On 4th down, Glover connected with Leonard for another deep pass and a 27 yard gain, bringing the Saints just outside the endzone. From 2 yards out, Glover kept the ball to himself and ran it up the middle for the score. 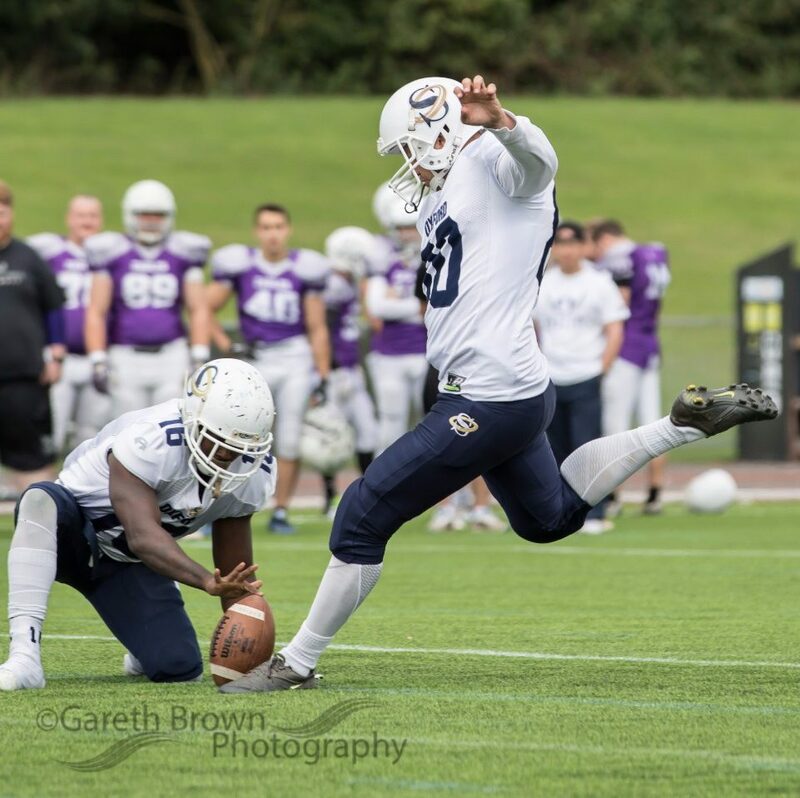 Fielden attempted the extra point kick, but the ball was batted down and scooped up by Solent’s Hassan Mugambwa as he took off towards the opposite endzone. Despite a valiant attempt from Jason Williams to pursue him, Mugambwa was two steps ahead and returned the ball for a 2 point score. 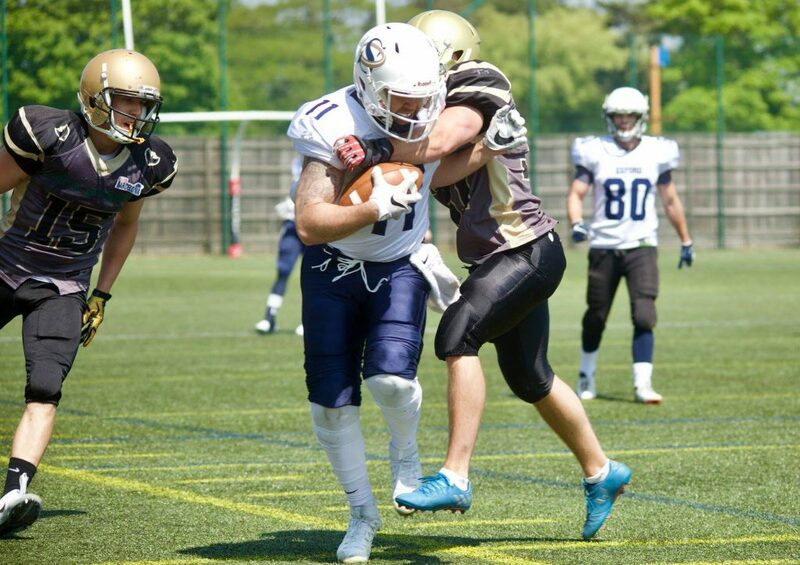 With Oxford kicking the ball to the Thrashers following their 2 point score, the special teams unit struggled to bring down the speedy Dayle Greenfield, who returned the ball 72 yards giving Solent another 6 points. 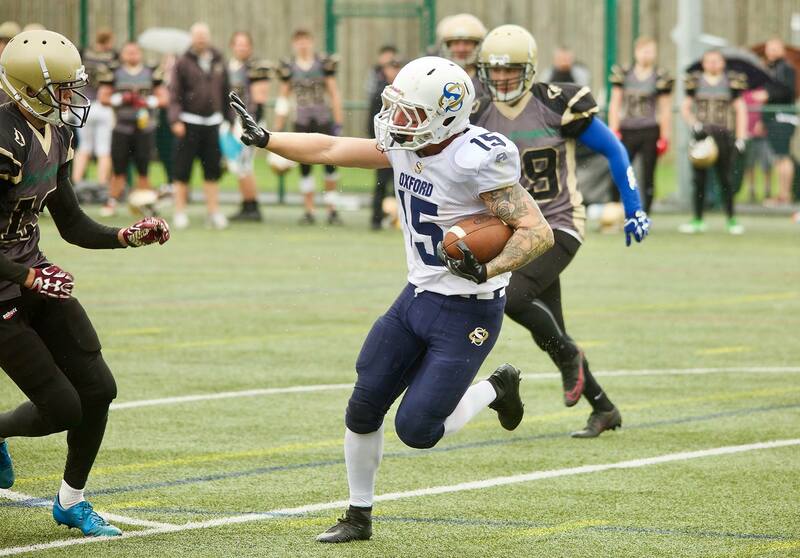 Matt Hewlett added the extra point, with the Thrashers narrowing the scoreline to 13-9 in back to back plays. Solent were fired up coming into the 2nd half following their two scores on special teams. Their offense kept the ball on the ground but couldn’t overcome a tough Oxford defense who made a strong stand on 3rd down. Opting to take the points instead of attempting a 4th down conversion, Hewlett kicked the ball through for a field goal from 29 yards out. Later in the 3rd quarter, Solent took their first lead of the game on the 2nd play of the drive with Sawyers completing a pass to his favourite target Greenfield, escaping up the sideline for the touchdown. 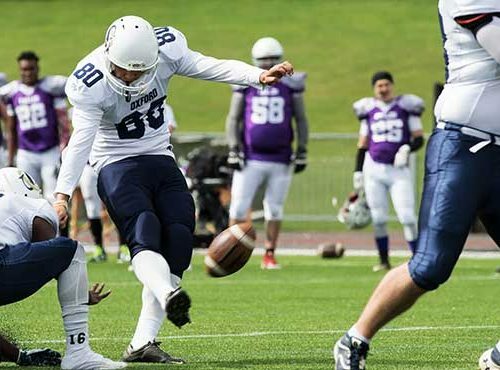 Hewlett remained consistent and added the extra point. 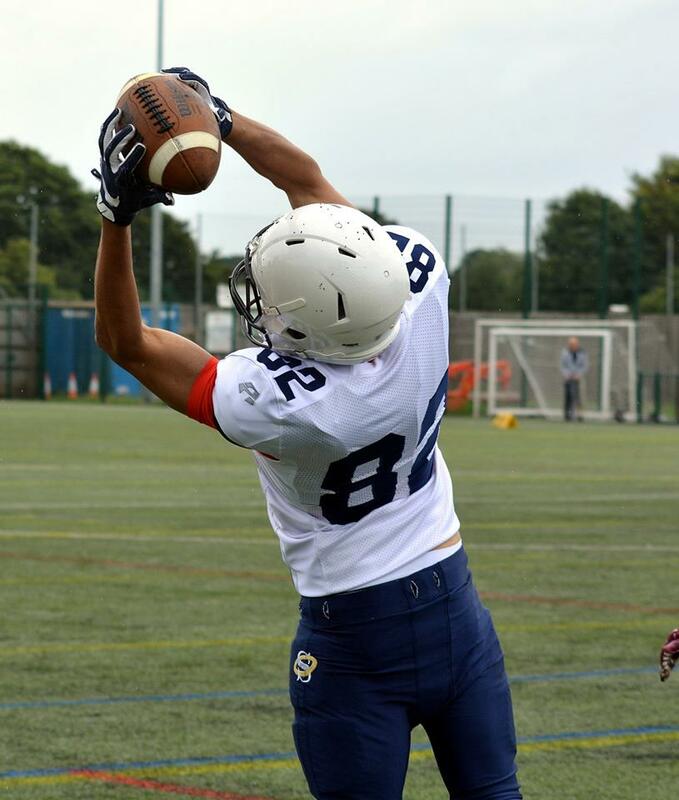 With both sides exchanging drives in the 4th quarter but unable to find the endzone, Oxford put quarterback James Sharples into the mix but his pass was intercepted by Solent’s Alistair Hugo, returning it 41 yards into the Saints endzone for a defensive touchdown. The Thrashers attempted to run the ball in again for a 2 point score but were unsuccessful. Looking to move the ball in the air and add a consolation score, Sharples narrowly missed connecting with Leonard deep downfield on what could have been a touchdown play, but the ball fell incomplete inches away. The Solent defense maintained their strong form and ended the game without giving up any points to Oxford in the 2nd half. The Saints now fall to 0-1-2 (1 tie and 2 losses) after this recent result to the conference leaders. 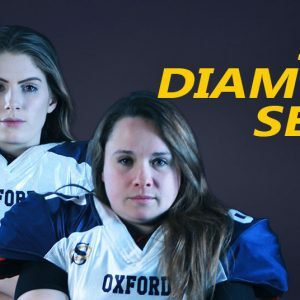 With a training week ahead of them, Oxford will next travel to Brighton to take on the Sussex Thunder on 3rd June in the hopes of securing their first win. 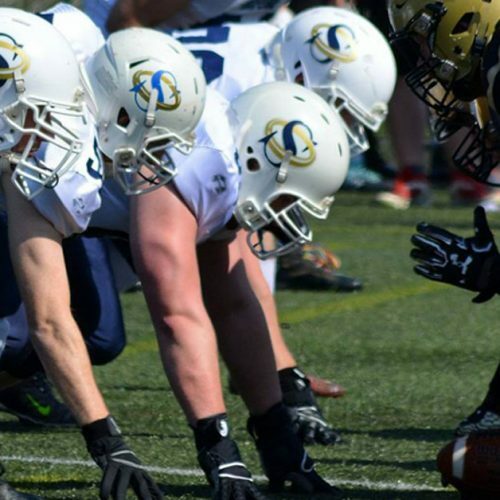 On Sunday 30th July the Oxford Saints closed their Division 1 season in style with a 24-22 home victory over the Ouse Valley Eagles. The Saints and Eagles faced each other three times this season, with Oxford coming out on top in two of those contests. 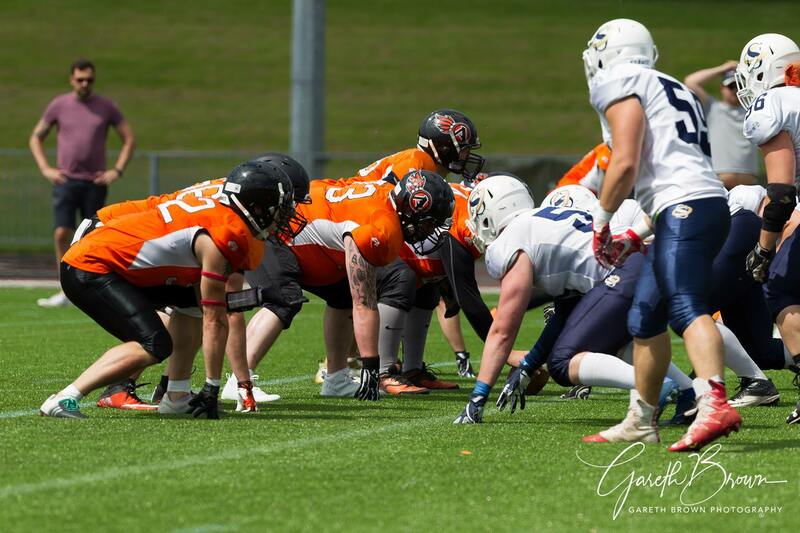 They gained a decisive 35-14 win on 7th May at home, then stumbled to a 20-6 loss on the road in a surprising defeat, but avenged it with the win last Sunday at Tilsley Park. A exciting game from start to finish, the Saints began with the ball and drove into Eagles territory before quarterback Kyle Swann was intercepted. The Ouse Valley offense took over but faced a tough defensive front from Oxford, with Spencer Duffy and Conor Whitehouse sacking quarterback Nick Tilbury for a loss of yards. On 4th down, the Eagles attempted to punt but the ball was not set in place and was eventually downed for a further loss of 8 yards. Swann and the Saints offense took over on the 3 yard line and running back Tony Glover charged up the middle for the opening score. Sam Fielden kicked the extra point to give Oxford a early 7-0 lead. With Jamahl Watson moving the ball on the ground for the Eagles, the visiting team found the scoreboard in the 2nd quarter with a 28 yard field goal from Mike Turner. The Saints hit back immediately and marched steadily across the field. Good running from Glover and Sam Armstrong brought them close to the endzone, with Armstrong entering from 7 yards out on a reverse play for the touchdown. Fielden’s kick went through for the extra point. On offense, the Eagles were making progress in the air with back to back grabs from Ryan Bowtell but they were unable to get into scoring distance before the end of the half. 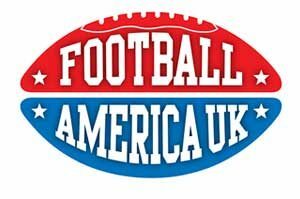 The visitors began with the ball in the 3rd quarter but a tackle for a loss of yards by George Wright and another stop from Martin Fitzpatrick brought on the Eagles punt team on 4th down. Oxford added a quick score on just the 2nd play of the next drive when Glover escaped up the sideline and out paced the Ouse Valley defenders for a 54 yard touchdown run. Another good kick from Fielden gave the Saints a 21-3 advantage. The Eagles made changes in their offense with Kase Chibwe and Jacob Givens getting the bulk of the work, including some direct snaps to Chibwe. They progressed to the Saints endzone with Chibwe running in for the score. A 2 point conversion attempt failed. More running from Chibwe and Givens kept the offense moving and Chibwe broke through defenders for a 27 yard touchdown run to narrow the gap. Mike Turner attempted to add a extra point but the ball was not set in place. A short drive from the Saints saw them having to punt the ball away on 4th down, after picking up minimal gains from Glover and a incomplete pass intended for Dre Kays. A short punt however gave the Eagles good field position, starting on the Saints 28 yard line. Oxford looked set to make a defensive stand after tackles from George Wright and Dean Bryan, but on 4th down Tilbury threw a pass to Akintunde Adewale over the middle for a 24 yard touchdown. This time Turner was able to kick the extra point and the Eagles took the lead. Deep in the 4th quarter, it was vital for Oxford to maintain possession of the football but their next drive stalled and they were forced to punt again. With the Eagles offense back on the field, they were stopped in the backfield with a tackle from Monica Lewinska for a loss of 2 yards and then a fumbled ball was recovered by Michael Bearman, giving the Saints possession again. Taking over on the Eagles 21 yard line, Oxford faced a tough defense and on 3rd down Glover was tackled for a loss of 2 yards. Attempting to take back the lead, head coach Andrew Day called for a field goal and Sam Fielden kicked the ball through straight through from 34 yards out. 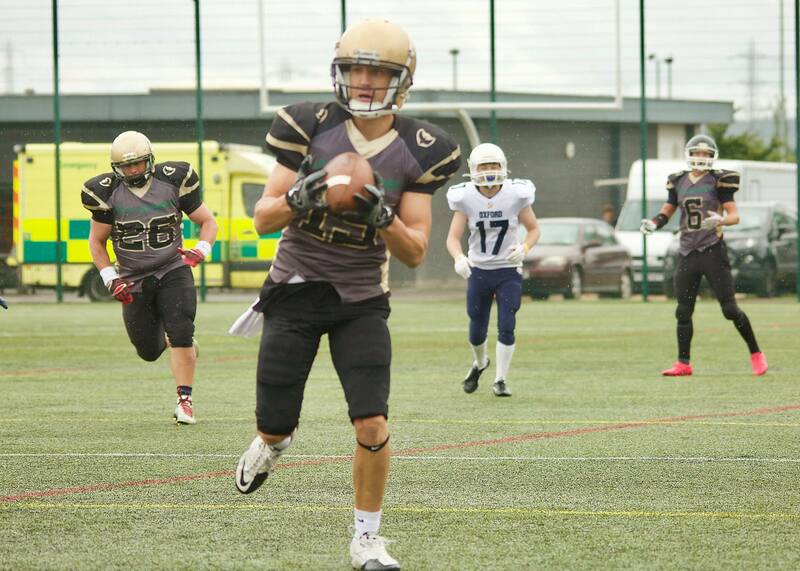 With everything riding on the final drive for Ouse Valley, they picked up 18 yards and a first down but struggled to make gains in the air with Misha Brookes breaking up the pass. 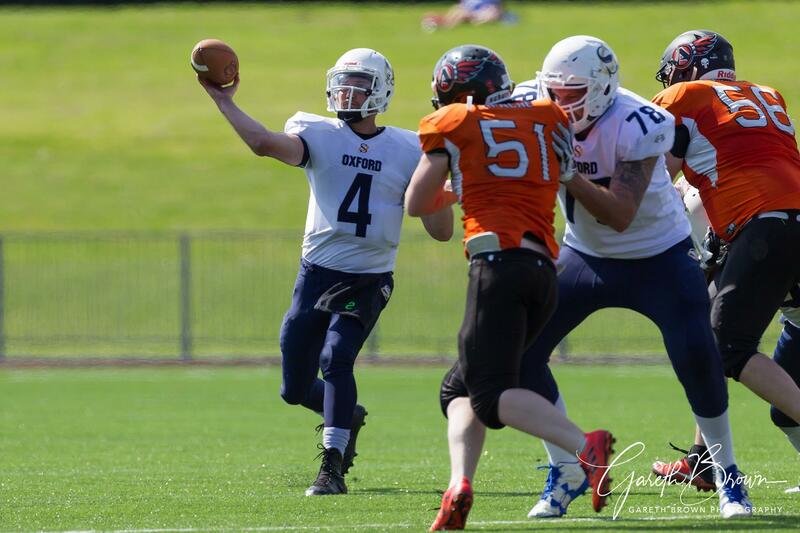 On 3rd down, Sam Stancombe tackled the ball carrier for a loss and a 4th down pass attempt to Adewale was batted down in the air by Martin Fitzpatrick. With under 2 minutes remaining, the Saints played it safe and ran down the clock with Kyle Swann taking a knee to see out the game. 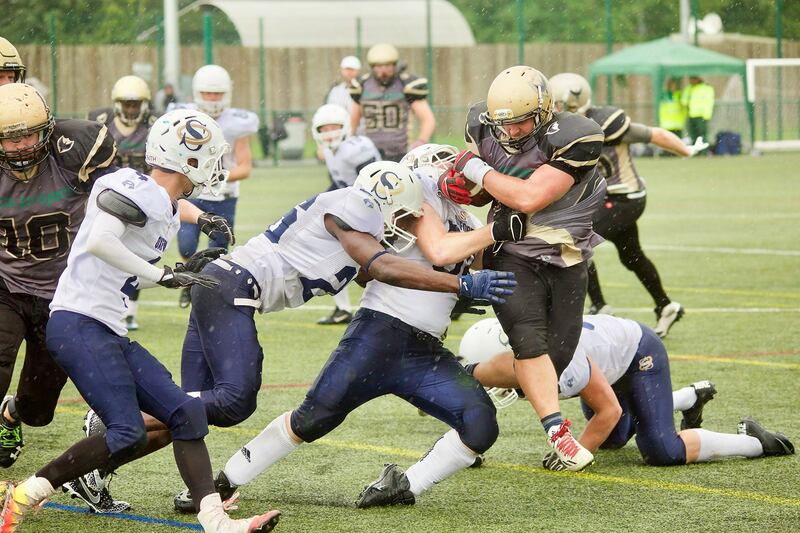 After a unexpected heavy defeat to the Solent Thrashers on 23rd July, the Saints were on the back foot in the playoff race and needed two things to happen to stay on track. 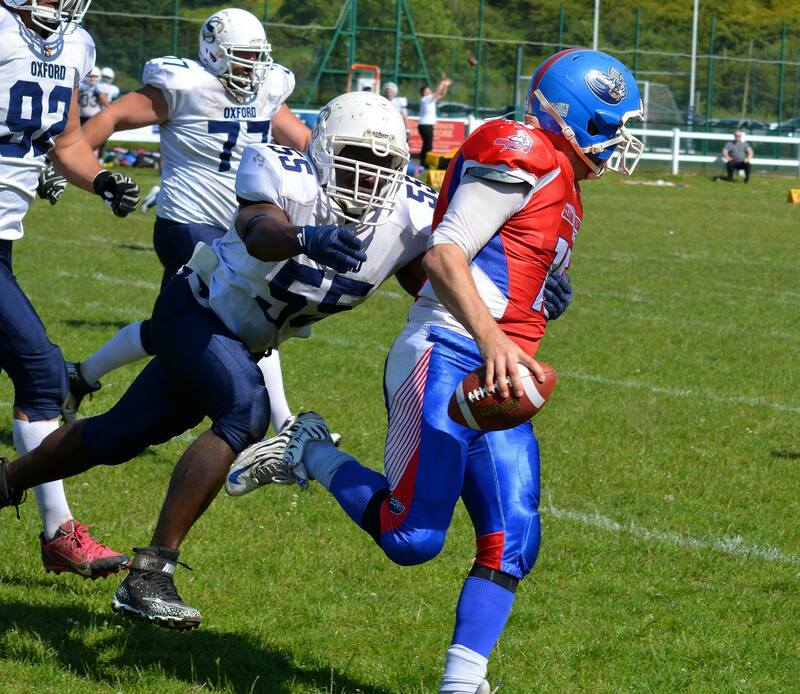 Firstly, a victory over the Eagles and for the 0-9 South Wales Warriors to pull off a win over Solent. Whilst Oxford beat the Eagles, the Warriors fell to the Thrashers in a earlier kickoff on the same day and the game between the Saints and Eagles was to determine who would be 3rd in the conference. On Sunday 23rd July the Saints hope for playoff football took a blow when they were on the wrong side of a 40-21 scoreline in Southampton. With QB/RB James Walter unavailable for the game and running back Tony Glover in a limited capacity, the Saints were without their two main weapons on offense and the difference showed. 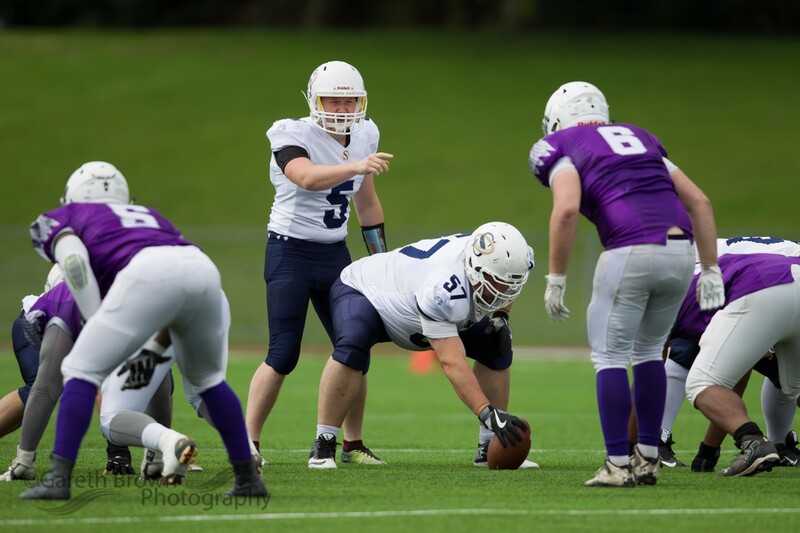 Oxford struck first despite having to punt on their opening drive when a Solent player touched the ball, making it available to be claimed by either team. With the Saints diving on the ball, the offense came back out with improved field position. With 2nd year quarterback Kyle Swann leading the unit, he connected with veteran receiver Sam Armstrong for a 24 yard gain and just short of the goal line. The ball was then handed to Antonios Athanasiou who ran it in for the touchdown from 1 yard out. Sam Fielden kicked the extra point to give the Saints the early lead. Oxford’s defense claimed a 1 yard sack on Solent’s drive as Conor Whitehouse brought down quarterback Bradley Sawyers behind the line. On the next play however, a mis-aligned coverage resulted in Sawyers completing a deep pass to Dayle Greenfield for a 63 yard touchdown. Samuel Scott attempted to run the ball in for a 2 point conversion but failed. The Thrashers moved the ball well and in the 2nd quarter Sawyers connected with Greenfield again, this time for a 45 yard touchdown. Scott ran through to add the extra 2 points. On their next drive, they kept the ball on the ground and picked up several first downs as they approached the endzone. Tom Borsay added their next score running in from 1 yard out, with another failed 2 point conversion. With Oxford down by two scores at the half, the Saints defense were struggling to stop the big passing plays from Sawyers and Greenfield, along with their own offense being slow to make gains. The Saints defenders made a stop at the beginning of the 3rd quarter with Whitehouse tackling the ball carrier for a loss on 4th down. Both teams exchanged possession of the ball but it remained on the Saints half of the field, with the Thrashers unable to score and the Saints unable to make consistent yards. A 23 yard run from Solent took them to the goal line and Borsay broke the deadlock. The ball was not put in place for the extra point kick and the attempt was no good. The Saints found relief early in the 4th quarter with Swann completing a 27 yard pass to rookie receiver Dre Kays. Tony Glover came onto the field for the first time in the game and combined with Luke Fry for first downs. On 4th down, Swann completed a quick pass to Charlie Day for a 12 yard gain and the offense gained a crucial first down. From 6 yards out, Richard Bloomer received the ball on a reverse play and ran into the endzone for Oxford’s first score since the first quarter. Glover added the extra 2 points. 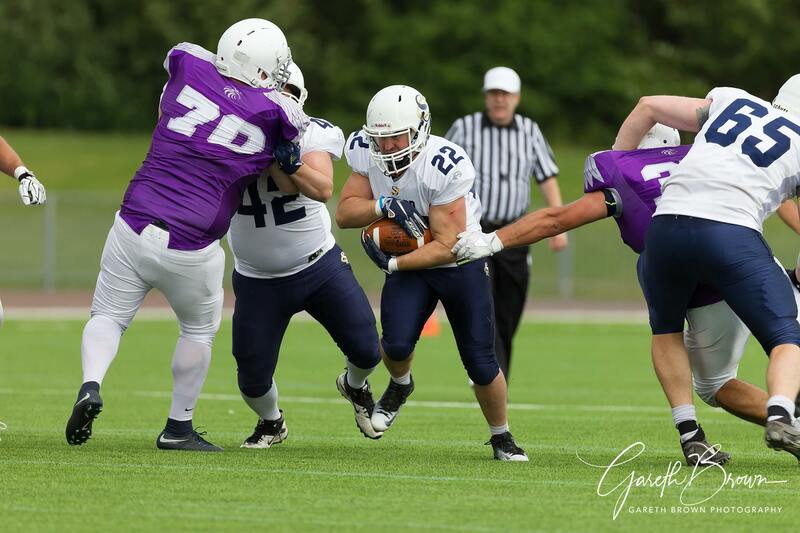 Despite the Saints touchdown, the Thrashers continued to move the ball well against the defense and Adam Bowley scored on a 28 yard touchdown run on their next drive. Bowley also attempted the 2 point conversion but was unable to cross the line. 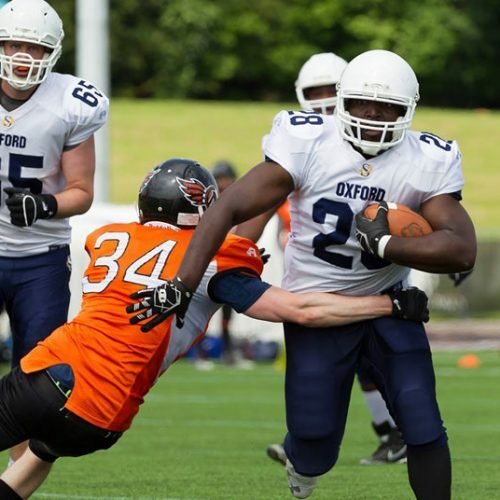 Oxford responded quickly with penalties against Solent giving the Saints improved field position. On 3rd down, Glover entered the endzone from 7 yards out but Fielden’s kick was blocked. The Thrashers showed their efficiency in the air with Sawyers completing another deep pass to Greenfield on the first play of the drive, who ran into the endzone for a 58 yard score and his 3rd of the day. Scott added the 2 points. 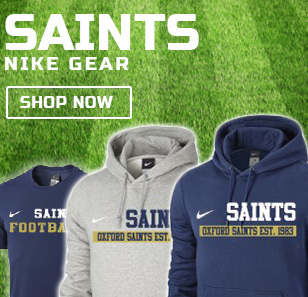 With back to back losses against teams the Saints swiftly beat earlier in the season, Oxford are now at risk of missing the Division 1 playoffs. 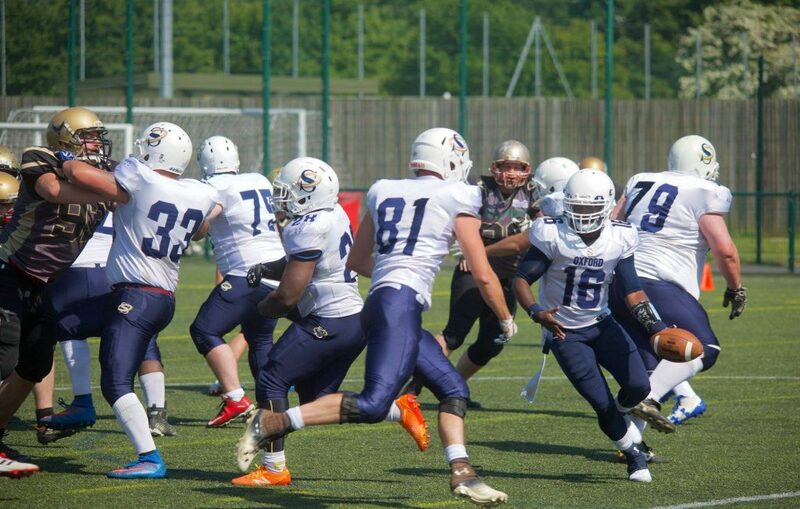 To reclaim their spot, the Saints will need a win against the Eagles on Sunday 30th July and for the 0-9 South Wales Warriors to pull of a victory over the Thrashers on the same day. 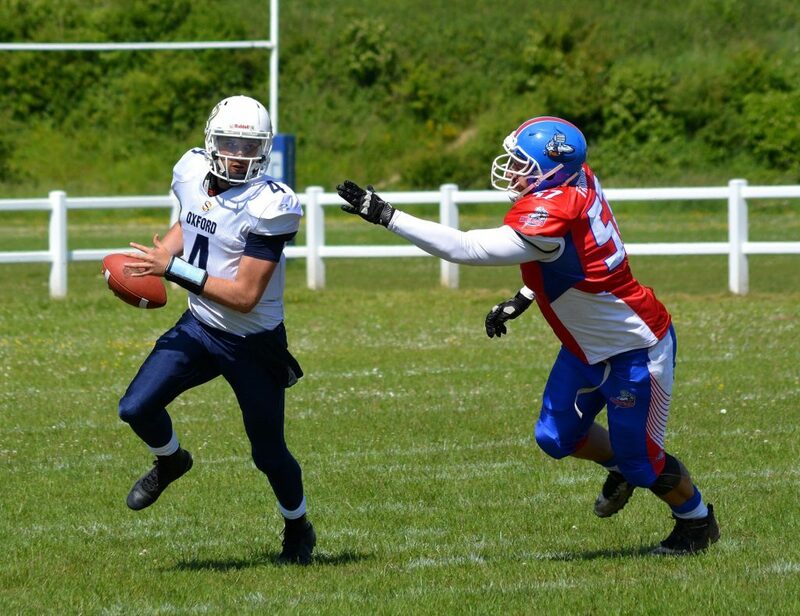 Despite a disappointing 2nd half of the season, the Saints will be pleased that they were competitive in their first season back in Division 1 which included two close games against the undefeated conference champions, Sussex Thunder. 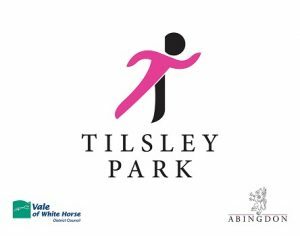 Oxford’s final game of the regular season is at Tilsley Park on Sunday 30th July against the Ouse Valley Eagles. Kick off is 14:30 PM.